This is a guest post from Jonathon Monk of Cycling Made Easy. Electric bicycles are an increasingly common sight in cities throughout the world. With more and more people choosing to take to two wheels, these bikes offer the perfect opportunity to enhance fitness while playing an important role in helping to reduce the carbon emissions generated by other forms of transport. These bikes are helping to persuade many non-cyclists to start pedaling but it is important to understand that making your purchase is just the first step. Once you have bought your e-bike, it is crucial that you take the necessary steps to ensure that it continues to run at its optimum level, and few aspects of an e-bike are more important than its battery. Enhanced technology has seen many electric bike manufacturers utilize the benefits of long life lithium batteries. While these batteries offer a significant upgrade over their predecessors, it is still important that certain guidelines are following to maximize their lifespan and run time. Below we have outlined the top 5 lithium ion e-bike battery care tips which will help you along the way. 1. Owners Manual – Read and follow the owners manual and warning stickers supplied with your bike. If you have any questions, call your e-bike dealer or the e-bike company directly and ask. 2. The Charger – Only use the charger supplied with your electric bike. Using a different charger can be very dangerous; possibly resulting in fire and/or explosion. So use the charger that came with your e-bike. 3. Fully Charge – When you get a new e-bike make sure you fully charge the battery per the instructions provided with your e-bike before you ride the bike. 4. Avoid Extreme Temperatures – Very hot or cold temperatures can negatively affect the the performance of the battery and shorten its expected life. Avoid storing and charging you battery in a garage or shed that could be subject to really hot or cold temperatures. Instead, charge and store your battery in a moderate temperature area. Recommended storage temperatures are 32F – 77F. Avoid exposing the battery to extreme heat, 104F + for long periods of time. 5. Storing a Lithium Battery – If you will not be riding your electric bike for an extended period of time it is a good idea to store your lithium battery with a full charge. At the 3 month point, check the state of charge and recharge to top it off if necessary. 6. Charging Location – When charging your bike or battery, do so in a location that is dry, and where a hot battery or hot charger (should there be a malfunction) will not cause a damaging fire. 7. Avoid Humidity – Store your bike, battery and charger in a location that is dry. Water and humidity are not good for any electrical device. Checkout this article for more information on the different types of electric bike batteries with additional battery care tips. By following these 5+ tips, we believe that you and your bike will enjoy many long and trouble free journeys together. Jonathon Monk is an enthusiastic cyclist and works for Cycling Made Easy. Cycling Made Easy are the regional stockists for SCOTT and can give advice and guidance plus accompanied test rides to make sure that customers feel comfortable and can experience E-Bikes first-hand before looking to buy. Great advise!. Question…Is there any company you would recommend to buy a battery and conversion kit? It is hard for me to recommend a specific brand but here is a guide to electric bike kits. This person also has a regular web store outside of ebay and I have purchased items from there. If a 20 ah battery is not what you are looking for he has other batteries as well. 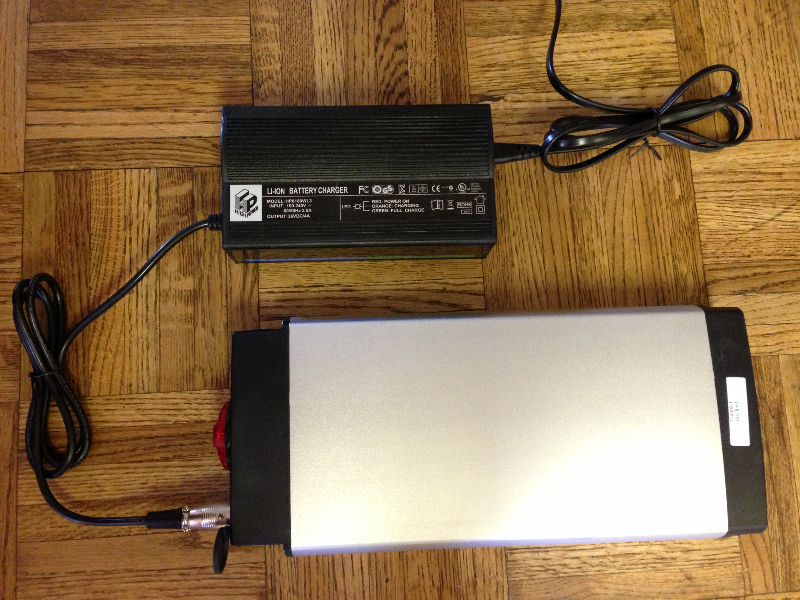 I am running Ampedbike 500-750 watt 36v kit with this battery and no problems. Almost forgot these are bare batteries so need battery bag or something to carry it in. Thank you Pete for posting this great advice. I have also read that you should not use the battery if it is colder than 46 F outside. Is this true? I live up in the mountains and it gets way colder than that. I’m going to be traveling without my bike for about 7-8 weeks. What should I do about my Prodeco battery to keep it healthy? Charge it before I leave, let it run down some, or? Yes, you will want to give it a full charge before you leave and then a full charge when you get back. So who makes a charger that will the above for you. You come home, plug it in and forget it. The charger will detect how hot the battery already is and automatically delay the charge. The charger will automatically shut off when fully charged and then automatically trickle charge every once in awhile. Maybe the charger could even be wireless and send you an email that it getting too cold out here, or too hot out here. I’d pay extra for a smart charger that would protect my lithium battery. Thanks Pete for having your guest address this question. I think I may have been the one that asked you for the charging tips for a lion battery several months ago. Happy trails. I purchases a hill topper from Clean Republic a few months ago and I daily ride over Diamond Head Mountain here in Honolulu. Ten mile ride and only use the hub going up the mountain, maybe two miles. Seems the ion battery seem to run out of charge a lot quicker than it did when new. I would often use the hub when some strong head winds, or assisting crossing intersections. Just how long a life can I expect from one of these batteries when used daily? You can expect to get 500-700 full charge/discharge cycles from most lithium ion batteries. Some lithium batteries will provide more cycles. 1) Where I live, it is often 95 degrees (35C) during the day and 55 degrees at night. By charging at night, I reduce the internal temperatures of my batteries as they charge, which causes less damage to battery life. Batteries don’t like heat, and they get hottest as they charge. 2) I’m on time of day electricity pricing, and it’s slightly cheaper to charge at night. 3) I set the timers to charge for about 4 hours a night, and then leave the bikes plugged in all the time. This way, they are always topped off, without the overcharging risk and power drain of having the bricks use power all day long. Recently purchased Izip, they suggested initially charge and discharge battery completely 3 times. could you suggest how much is completely? The yellow light is still on and the battery is still pushing the bike but it is over 50 miles using PAG. Check out Currie’s most current battery care sheet here: https://goo.gl/mJreLi. Basically we no longer recommend conditioning cycles. That idea was mostly a holdover from SLA and NiMH chemistries; it’s dubious whether it makes sense for the end user to condition Li+ batteries. In any case, our cells are cycled/tested at the manufacturer before being built into packs (as all new cells are), so when you get a new battery, it’s ready for use! I travel w/trailer and I want to use the truck charging system to top off batteries. Is this possible w/out damaging the battery?? Also can I charge it w/ie2000 watt Honda generator without damage.